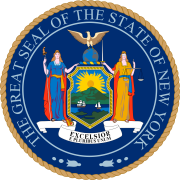 The 1970 United States Senate election in New York was held on November 3, 1970. Incumbent Republican U.S. Senator Charles Goodell, who had been appointed to the seat by Governor Nelson Rockefeller in 1968 following the assassination of Sen. Robert F. Kennedy, sought a full term. Goodell was challenged by Democrat Richard Ottinger and Conservative James Buckley. Buckley prevailed. The convention used a weighted voting system. The Liberal Party unanimously designated Timothy W. Costello as its Senate candidate placeholder on April 4th, 1970. A convention of the 300 member state committee was held on May 11th to designate the actual candidate. This page was last edited on 3 February 2019, at 15:56 (UTC).